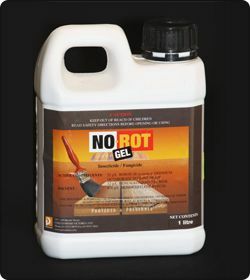 No-Rot Gel is a ready to use, water based brush on wood preservative, to control the spread of decay. It is formulated to penetrate by diffusion into the timber, while still allowing the surface to be painted over. No-Rot Gel can also be used to kill surface mould, algae or fungi. It can also be used on timber, masonry or concrete surfaces. No-Rot Gel can be used as a timber treatment where it has been affected by decay, mildew or insect attack. No-Rot Gel is ideal for use in external areas such as timber window frames and posts that are intended to be painted with an oil or water based paint. It is also ideal for use in internal timber framing where moisture is a problem, such as bathrooms or under subfloors with poor ventilation. RESTRAINTS. No-Rot Gel is not to be used on timber exposed to rain (ie without a painted finish or surface coat), timber in contact with the ground, or surfaces that come into contact with foodstuffs or drinking water. No-Rot Gel will not restore timber severely damaged by rot and termite attack. Unsound wood within any timber structure should be replaced. The new wood must then be treated with No-Rot Gel to prevent deterioration in the future. Apply No-Rot Gel to the timber surface using a brush, roller or spray gun. If the timber is very dry, it is best to dampen the timber with water to allow better penetration of No-Rot Gel. For effective treatment against decay, mould and insect attack, use the following table apply the correct dosage to the timber. For correct dosage rates, No-Rot Gel will require 2 coats. Allow 2-3 hours between coats. Timber treated with No-Rot Gel can be painted over with either oil or water based paints, primers and undercoats. For best results, allow 5 – 8 days for the timber to thoroughly dry. Available in 1 Litre, 5 Litre, 10 Litre, and 20 Litre drums. Store in a cool dry place out of direct sunlight. Keep out of the reach of children. No-Rot Gel has a shelf life of 18-24 months depending on how it’s stored. Avoid contact with eyes and skin. When handling No-Rot Gel, wear protective clothing, gloves, eye protection and a vapour mask if spraying. Wash contaminated skin or eyes with copious quantities of water for 15 minutes. If ingested, give water to drink. Do not induce vomiting. Seek medical assistance and contact the Poison’s Information Service on 13 11 26.